Brorfelde landscape by Stig Nygaard (cb) After adding an aggressive curve along with a mid-tone luminosity mask. I had previously written about adapting Tony Kuyper’s Luminosity Masks for GIMP. I won’t re-hash all of the details and theory here (just head back over to that post and brush up on them there), but rather I’d like to re-visit them using channels. 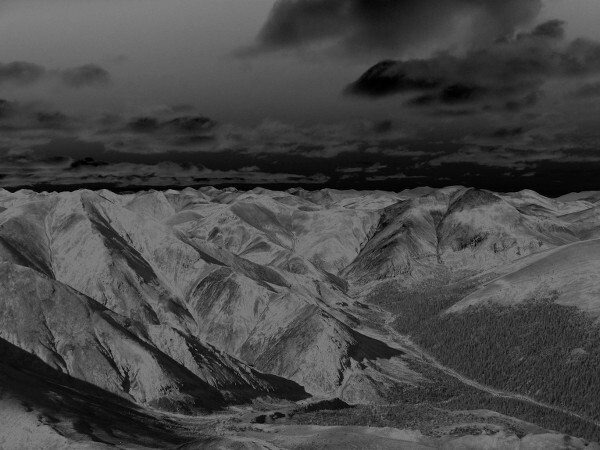 Specifically to have another look at using the mid-tones mask to give a little pop to images. 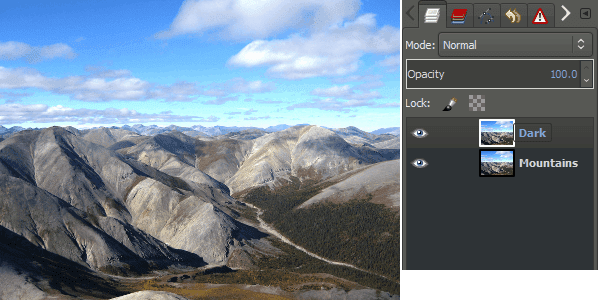 Let’s Build Some Luminosity Masks! The way I had approached building the luminosity masks previously were to create them as a function of layer blending modes. 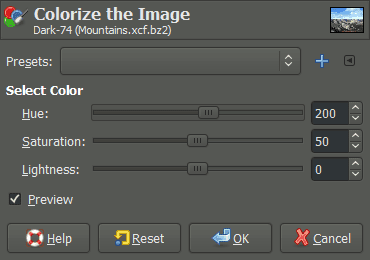 In this re-visit, I’d like to build them from selection sets in the Channels tab of GIMP. I’ve also written a Script-Fu that automates the creation of these channels mimicking the steps below. We’ll start off in a similar way as we did previously. This desaturated copy of your color image represents the “Lights” channel. What we want to do is to create a new channel based on this layer. The easiest way to do this is to go to your Channels Dialog. 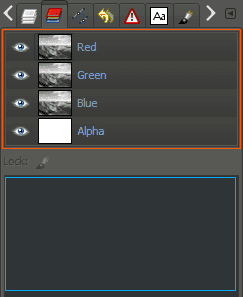 On the top half of this window you’ll see the an entry for each channel in your image (Red, Green, Blue, and Alpha). On the bottom will be a list of any channels you have previously defined. 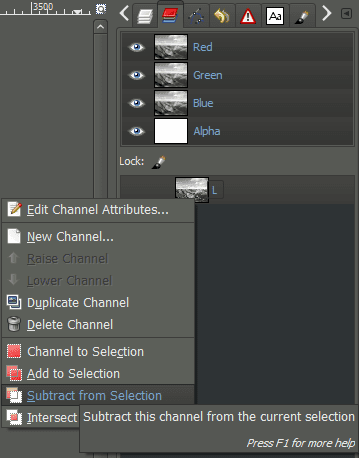 To create a new channel that will become your “Lights” channel, drag any one of the RGB channels down to the lower window (it doesn’t matter which - they all have the same data due to the desaturation operation). Now rename this channel to something meaningful (like “L“ for instance! 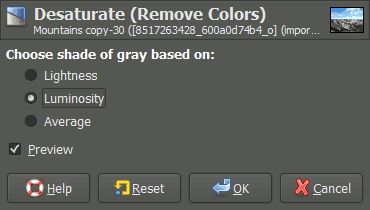 ), by double-clicking on its name (in my case it’s called “Blue Channel Copy”) and entering a new one. 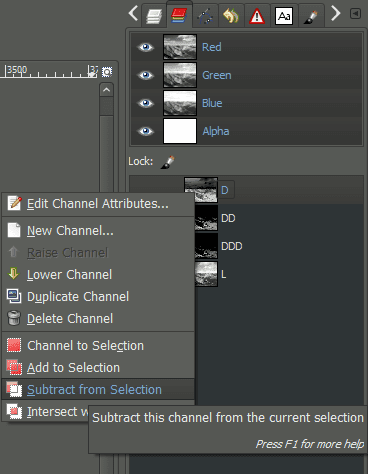 To create the “Darks” channel, it helps to realize that it should be the inverse of the “Lights” channel. We can get this selection through a few simple operations. 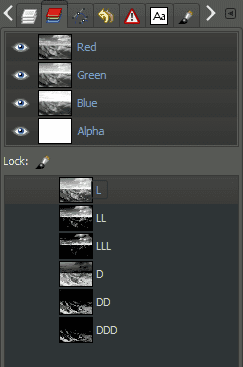 We are going to basically select the entire image, then subtract the “Lights” channel from it. What is left should be our new “Darks” channel. Remember, you should be seeing the “marching ants” around your selection - in this case the entire image. 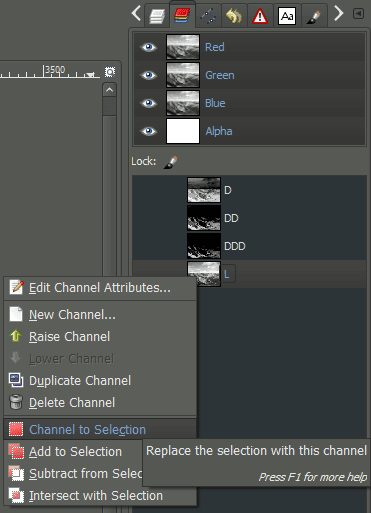 This will create a new channel in the Channel dialog (probably named “Selection Mask copy”). To give it a better name, just Double-Click on the name to rename it. Let’s choose something exciting, like “D“! At this point, you’ll have a “Lights” and a “Darks” channel. 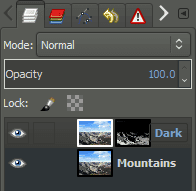 If you wanted to create some channels that target darker and darker regions of the image, you can subtract the “Lights” channel again (this time from the current selection, “Darks”, as opposed to the entire image). Once you’ve subtracted the “Lights” channel again, don’t forget to save the selection to a new channel (and name it appropriately - I like to name subsequent masks things like, “DD”, in this case - if I subtracted again, I’d call the next one “DDD” and so on…). Three levels of Dark masks created. At this point we have one “Lights” channel, and three “Darks” channels. Now we can go ahead and create two more “Lights” channels, to target lighter and lighter tones. The process is identical to creating the darker channels, just in reverse. To get an even lighter channel, you can subtract D one more time from the selection so far as well. Now we can generate our mid-tone channels from these. The concept of generating the mid-tones is relatively simple - we’re just going to intersect dark and light channels to produce whats left - midtones. To get started, first select the “L“ channel, and set it to the current selection (just like above). Right-Click → Channel to Selection. Then, Right-Click on the “D“ channel, and choose “Intersect with Selection”. You can repeat for each of the other levels, creating an MM and MMM if you’d like. 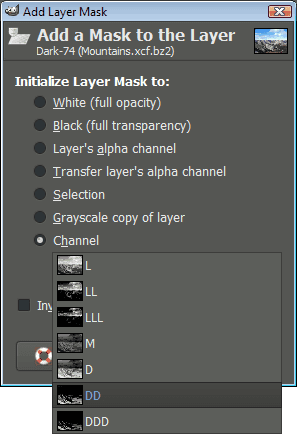 Remember, black tones in this mask represent full transparency to the layer below, while white represents full opacity, from the associated layer. The basic idea behind creating these channels is that you can now mask particular tonal ranges in your images, and the mask will be self-feathering (due to how we created them). So we can now isolate specific tones in the image for manipulation. 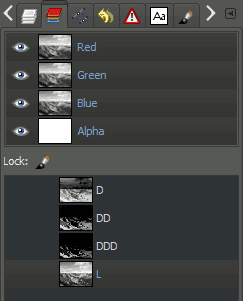 Now you’ll have a Dark layer with a DD mask that will restrict any modification you do to this layer to only apply to the darker tones. 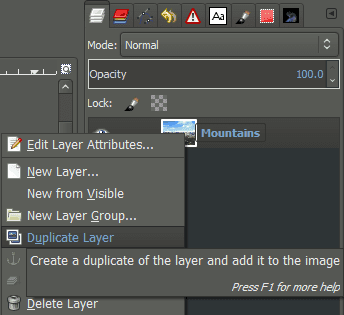 Make sure you select the layer, and not it’s mask, by clicking on it (you’ll see a white outline around the active layer). Otherwise any operations you do may accidentally get applied to the mask, and not the layer. 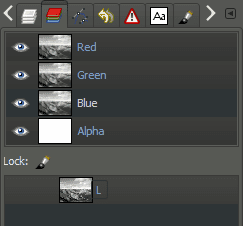 At this point, we now want to modify the colors of this layer in some way. There are literally endless ways to approach this, bounded only by your creativity and imagination. 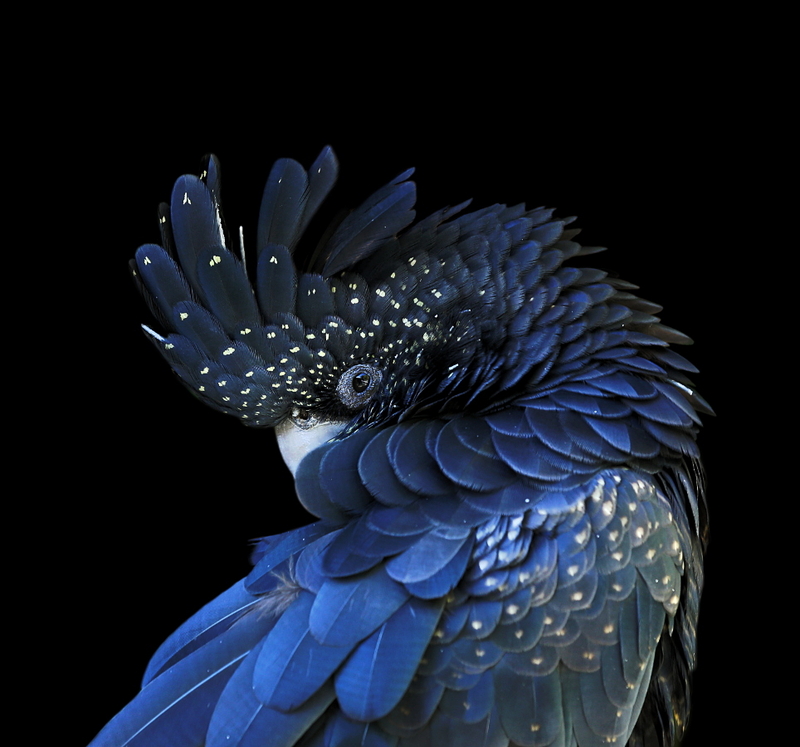 For this example, we are going to tone the image with a cool teal/blue color (just like before), which combined with the DD layer mask, will restrict it to modifying only the darker tones. Now, pay attention to what’s happening on your image canvas at this point. Drag the Hue slider around and see how it changes the colors in your image. Especially note that the color shifts will be restricted to the darker tones thanks to the DD mask being used! Now just repeat the above steps, but this time for the light tones. 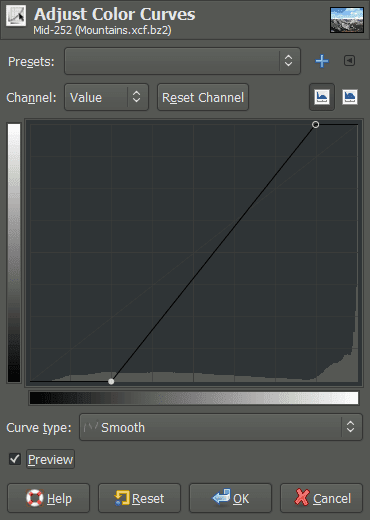 So duplicate the base layer again, and add a layer mask, but this time try using the LL channel as a mask. The real power here comes from experimentation. I encourage you to try using a different mask to restrict the changes to different areas (try the LLL for instance). You can also adjust the opacity of the layers now to modify how strongly the color tones will effect those areas as well. Play! The mid-tone masks were very interesting to me. 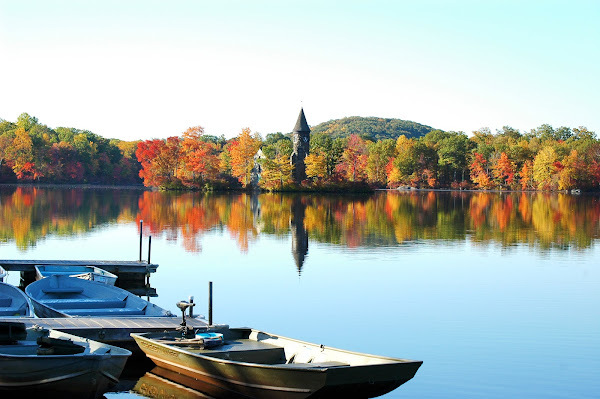 In Tony’s original article, he mentioned how much he loved using them to provide a nice boost to contrast and saturation in the image. Well, he’s right. It certainly does do that! (He also feels that it’s similar to shooting the image on Velvia). I’ve deleted the layers from my split-toning exercise above, and am back to just the base image layer again. To try out the mid-tones mask, we only need to duplicate the base layer, and apply a layer mask to it. This time I’ll choose the basic mid-tones mask M.
What’s interesting about using this mask is that you can use pretty aggressive curve modifications to it, and still keep the image from blowing up. We are only targeting the mid-tones. 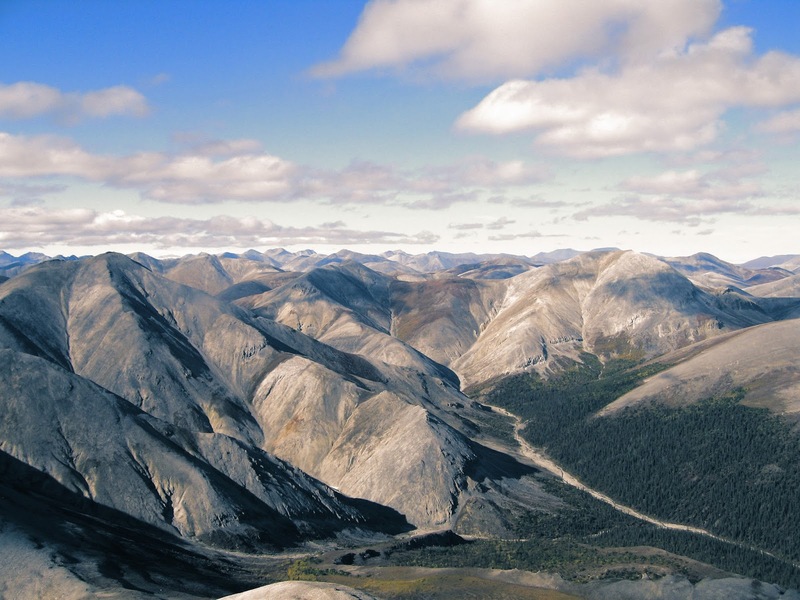 As you can see, there is an increase in contrast across the image, as well a nice little boost to saturation. 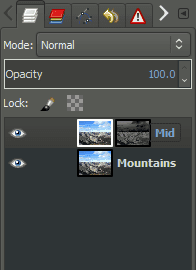 You don’t need to worry about blowing out highlights or losing shadow detail, because the mask will not allow you to modify those values. This is something that I’ve found myself doing quite often. It’s a very powerful method for combining color toning that you may like from different film emulations. Consider what we just walked through. 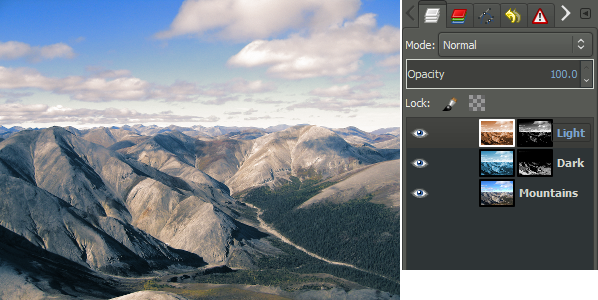 These masks allow you to target modifications of layers to specific tones of an image. 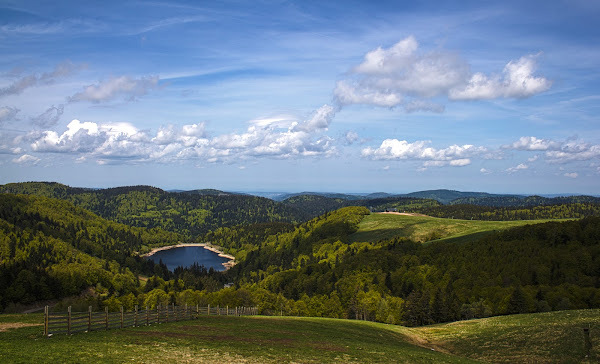 So if you like the saturation of, say, Fuji Velvia in the shadows, but like the upper tones to look similar to Polaroid Polachrome, then these luminosity masks are just what you’re looking for! Stay tuned later in the week where I’ll investigate this idea in a little more depth. This is just another tool in our mental toolbox of image manipulation, but it’s a very powerful tool indeed. When considering your images, you can now look at them as a function of luminosity - with a neat and powerful way to isolate and target specific tones for modification. As always, I encourage you to experiment and play. I’m willing to bet this method finds it’s way into at least a few peoples workflows in some fashion.